Growing up in a patriarchal society hasn’t been easy for university students Nada Ayoub and Jude Benhalim. Indeed, the shared struggle that Egyptian women go through on a daily basis served as the biggest drive behind their first encounter. Months later, Nada and Jude decided to combine their unique artistic gifts through Metamorph Luna, an enchanting union between poetry and design that attempts to empower women from all age groups through an invigorating, self-exploration journey. 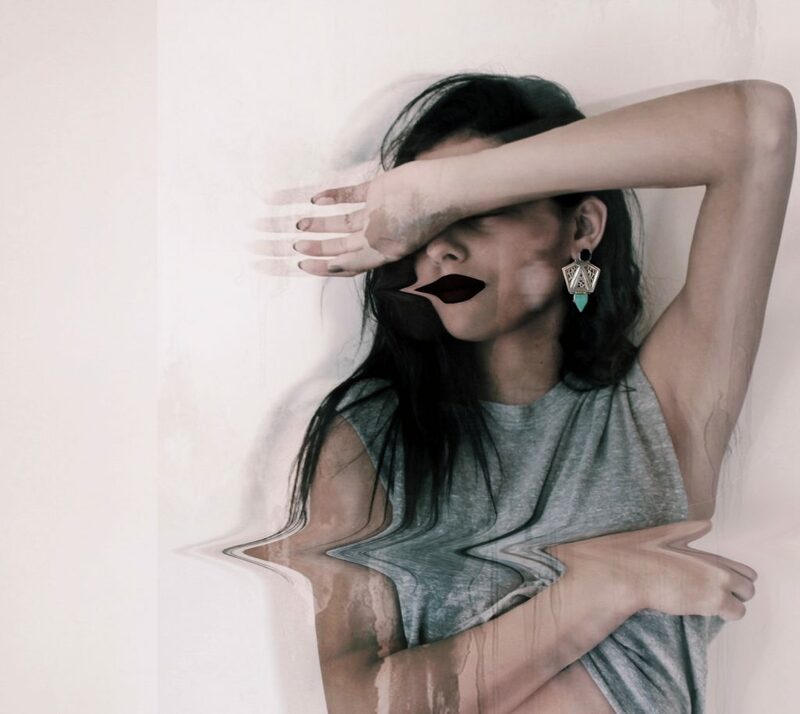 With a modern approach that utilizes visuals and poetry, Metamorph Luna looks set to inspire women from all age groups to introspect the different layers of their personality. Nada and Jude sat down with eniGma’s Mahmoud Al Badry for an interview that delved into societal pressures on women, their collaboration’s background, and the purpose behind Metamorph Luna. Tell us about yourselves, how have your artistic sides been developed? Jude: having lived my entire life in Egypt, I grew up in an ideal environment for pursuing design. It took one creative design project in high school to motivate me to establish my brand when I was just 17 with my mother and partner, Rana Alazm. From my family’s unique roots to the country’s vibrant surroundings, I’ve always attempted to introduce unique ways for women to powerfully embrace and express their individuality with flattering bold pieces. Nada: I’m a Hungarian-Egyptian writer who has been writing ever since she was 11. My writings have always revolved around feministic ideologies, contemplating life, empowerment and other themes that aren’t nation-specific. Amongst other things, I’ve also tried to be a creative entrepreneur, choreographer and singer who uses creativity as a means to empower and move others. How did you meet, and what led you to collaborate on this venture? Jude: we met during our university years, but grew appreciation for each other’s work randomly through Instagram, enjoying each other’s designs and prose. It all started with a simple meeting over coffee discussing women empowerment, our personal stories and where we’re both trying to go with our work. The rest, as they say, is history. How would you generally describe what Metamorph Luna is? 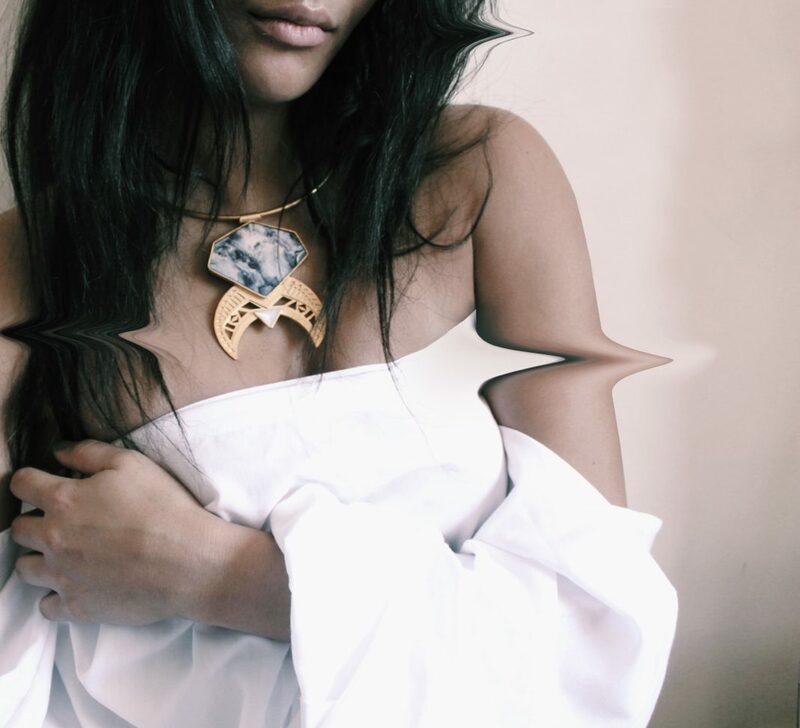 Nada: I would say that the collaboration is between a jewelry designer and a poet who both share a vision for empowering women to find themselves in solitude. Lots of women are scared to be alone, scared to do things alone, go out alone or spend time figuring themselves out. With a society that labels people and constricts us with definitions, we believe that women should undergo a journey of self-exploration to define themselves first before society puts any labels on them. It is the beginning of a series of sagas inspired by real women and their endless journeys of self-empowerment through the many worlds inside each of them, inside those around them and the world at large. With my writing acumen and Jude’s creative designs, Metamorph Luna came to life. The story and the concept video represent the stages that most women go through, specifically the solitude found in the galaxies around them and within them. Jude has designed a line related to the cosmos, so with that inspiration and our own personal stories, we decided to tell a story of a girl named Luna. What would you say makes this collaboration unique? Nada: Prose and jewelry haven’t joined forces in Egypt before to tell a story that goes beyond jewelry and letters. The way in which we intend to empower women through the medium of Instagram allows people to read and introspect within themselves while enjoying visuals and poetry. The concept video is pretty abstract and thus leaves a lot of room for our audience’s interpretation, which makes the collaboration have a more artistic feel compared to other projects. We consider the work to be about more than the jewelry and poetry. We want to really start a movement for women to look within themselves at themselves. How would you generally summarize the project? Jude: The campaign is inspired by the stories of real women and intends to inspire women of all ages to realm into their selves, understanding their true power and potential. The jewelry and poetry are both inspired by the stars, comets, and sublime nature of our galaxy, in which solitude and thinking take place. We believe that women find themselves by spending time with themselves first, delving into their souls and feeling comfortable with not belonging to a certain social standard, a certain person or experience. The galaxy is a space where emptiness and solitude is present. Most people in our generation fear the concept of being alone and correlate being alone with loneliness. Not many have the guts to travel alone, eat in a restaurant alone or take part in any social activities that we are conditioned to believe have to be done in a group, such as going to the movies alone for instance. Most importantly, people fear introspection and looking within themselves to find their inner peace. We believe that being in a cosmic galaxy, or a state of individuality, is the perfect space to grow and develop in. Why? Because one cannot delve into life, into relationships, into experiences without first being comfortable with who they are. What is your campaign comprised of? Nada: We split up the story of Luna into 10 stages. Each stage unfolds with two poems. 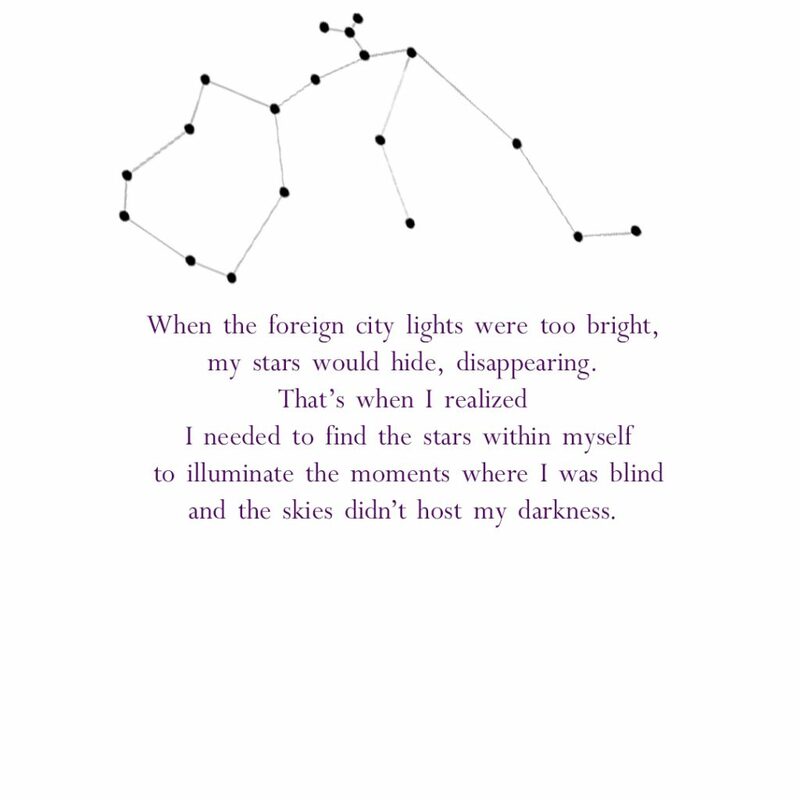 I post poetry; Jude posts images with captions that have the poetry. Each stage is described and has two poems from the perspective of Luna. The stages are disconnection, qualm, detachment, a search for answers, self-revolution, risky love, feeling broken, solitude, worthiness, and finally, autonomy. Jude: We collaborated with Plush Studios to create a concept video that shows the phases through which women go through this transformation. It is a bit different than most concept videos that are as it is philosophically and aesthetically heavy.